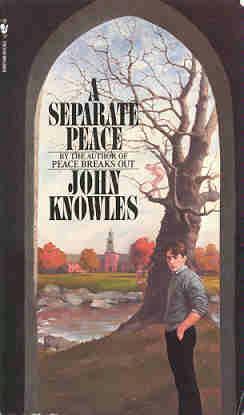 Episode 130: John Knowles, A Separate Peace | Book Fight! One of us read this famous WWII coming-of-age novel in high school, while the other is encountering it for the first time. Will it hold up to adult scrutiny? Should today’s high school students still be forced to read it? And are the two main characters totally gay for each other? Answers to these and other pressing questions on this week’s Book Fight! As always, you can stream the show right here on our site, by clicking on the little player thingy below. Or visit us in the iTunes store, or wherever you get your podcasts, where you can subscribe (for free!) and never miss another weekly installment. Categories: Episodes | Tags: canon or cannon?, did Gene try to hurt Phineas?, Is A Separate Peace gay?, Is A Separate Peace the whitest book ever written?, John Knowles | Permalink.